For a while now, I’ve been musing about the idea of using Gaelic ideas to base a system of divination around. Originally I was thinking of using cards, but the idea of using stones came to me more recently and I liked it. So pictured above is the result! There are 18 stones total, listed below. I may add two more stones but I’m not set on that idea as of now. 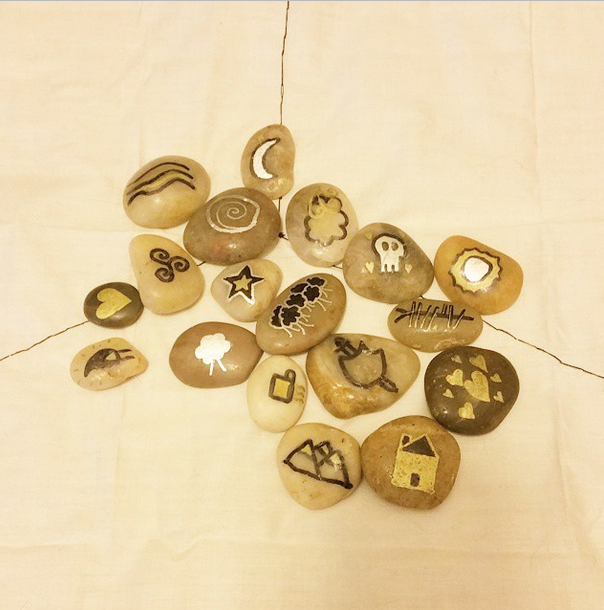 Eighteen stones with images symbolizing: Earth, Sea, Sky, Moon, Sun, Fire, Triskele, Honor, Family, Community, Fae, Otherworld, Gods, Ancestors, Hearth, Hospitality, Ogham, and Magic. I used a color coded system: black are abstract concepts, gold are tangible things in this world, and silver is Otherworldly things. There’s some overlap as you may guess, which makes for some interesting imagery. I read them by throwing them on a cloth divided into three sections. These trisections don’t represent anything and just help me see connections better. The center of the cloth is the “epicenter” which shows the most important issue or the topic closest at hand. I don’t read reversals typically. They have been really easy for me to use and understand so far. I’m not sure if I’ll be using them for other people, though. We’ll see what time has in store. 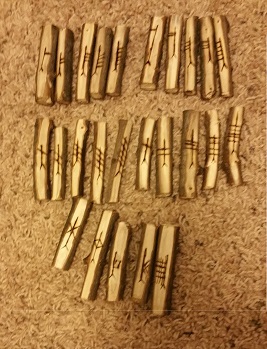 I actually also have Ogham Dice, but I have felt that I needed to also use Ogham Staves or sticks too. These pieces of wood were graciously given to me by my neighborhood tree and I give it MANY thanks! If you want to know more about Ogham, my friend Jared made a really awesome thread at Polytheist Community Forums about Ogham: The Great Big Ogham Resource Thread. I recommend reading it when you get the chance! Anyway, that’s all I have to update. Yay Ogham Staves! Bandraoi (pron. Ban-Dree): a term for a Druidess, this is what is given as the dictionary definition, but literally translated it is the same as Bean Draoi (woman, magic), which is a female User of Magic. I know I don’t talk about it here much, but I do practice magic. More so than my co-religious Gaelic Polytheists. And I want to help people through magic. While visiting with a group of witchy feminists, one of them shared how they believed they were cursed with bad luck. I really wanted to just grab her by the shoulders and help her with whatever magic I could grab my hands on. But I held back because I don’t advertise myself as a witch-for-hire (or a witch for that matter.) I realized I did need a way to talk about how I am a magic user and how I want to help others. So calling myself a Bandraoi is a great way to do it, without calling myself a witch. As for Bandfhaidh…I have also felt very in-tuned with divination lately. I’m still trying to get better and try new ways, but I love how much I have been able to provide clarity for people using cards and bibliomancy. I plan to make Ogham Staves and to get better with my Ogham Dice, too. It’s important to me. I also am getting more attentive to naturalistic signs. So that’s exciting, right? I hope I can continue to help people through magic and divination, as well as help myself. 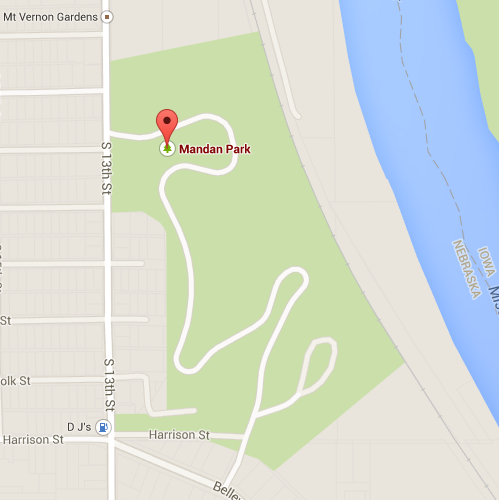 Today I braved the cold–and my agoraphobia–to explore a treesy park near the river! Partaking again in the Non-Binary Mysteries prompt! This one is about Lunar and Solar entities. However, I should have tried to curse someone. Because I didn’t, he may have gotten the chance to do more damage. I put it off. I changed that tonight. The candle is still burning. I may never know if it works but, if it does, he won’t be hurting anyone anymore.